The MacHaffie site was donated to the Archaeological Conservancy for preservation by Pamela Bompart in 2008, after owning in since 1975. It became the Conservancy’s first site preserve in Montana. Her husband Les Davis did the most contemporary archaeological investigations on the site in 1989-1993. The MacHaffie site has yielded evidence of Paleo-Indian occupation more than 12,000 years ago. It contains a Scottsbluff component dating to approximately 10,000 years ago, and it was used off and on by the Middle and Late Archaic hunter-gathers dating from 7,000 to about 2,000 years ago. MacHaffie is located south of Helena in the Prickly Pear Valley at an elevation of about 4,200 feet. An amateur mineralogist found the site in the 1940’s and reported to Edmund MacHaffie, the local newspaper editor. 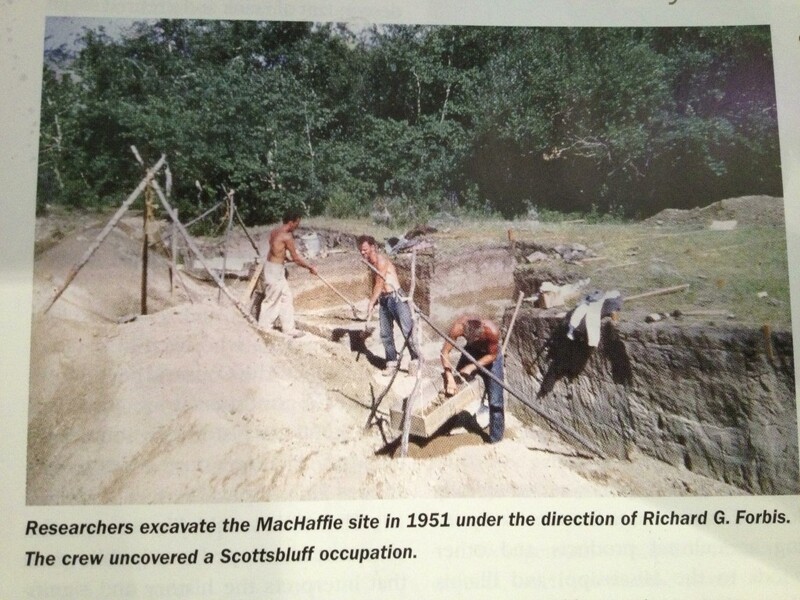 His wife discovered a Folsom point in the Scottsbluff component that was eroding out. Later archaeologists working with the River Basin Survey (RBS) visited the site and recognized its scientific potential. A survey was conducted under the encouragement of the RBS by Carling I. Malouf in 1950 and excavation in 1951 by Richard G. Forbis both under the purview of Montana State University. When word spread of the amazing finds the site was subject to hundreds of looters who ravaged the Middle and Late Archaic cultural deposits and the threated the underlying Paleo-Indian strata in some areas. Pamela Bompart purchased the site in order to protect it from looters. She worked with the State Historic Preservation Office to list the site on the National Register of Historic Places in 1986. The deep deposits that Les Davis excavated from 1989-1993 included materials below the Folsom level. The sub-Folsom deposited included more course-grained stone use and fragments of carbonized worked mammal bone. Unfortunately the bone could not be dated due to leaching of the collagen. The artifact collection was bequeathed to the Montana Historical Society Museum. Summary from a piece written by Les Davis. Les Davis a great support of the Conservancy and archaeologist died this fall in 2014. We honor his contributions and his memory.